When you live in a robust city, that always offers plenty of entertainment, you can’t always devote your entire evening to one particular event. The Whitecaps/Sounders game ran until just past eight o’clock, so I missed the chance to see Ceremony open up. On a side-note, The Weeknd was playing over at the Pacific Coliseum, but I usually choose small and intimate shows over venues with poor acoustics. Needless to say, I wasn’t going to miss Kele and company take the stage, especially whilst wearing a Marvin the Martian t-shirt. The show began in the same fashion as their latest record Four does, with the seesaw “So He Begins to Lie.” Okereke connected well with the audience right off the bat. Eye contact firm, demeanour playful, all while those feet bounced back and forth. After “Octopus” was cooked to perfection, the synths and guitars overpowered the vocals on “Hunting For Witches,” which was definitely a disappointment. Granted, the familiarity seemed to loosen up the 1100 or so in attendance. As the crushed PBR cans started formulating around my feet, the atmosphere was cranked a couple notches with “Banquet.” Originally finding a home on the debut self-titled EP, being recycled to Silent Alarm, this breakthrough single still has a grande effect on people. Amongst a few more from the new record, including a beautifully intimate performance of “Day Four,” Kele danced around to the punchy “One More Chance,” an unexpected but unique choice on the setlist. After a brief break, the Bloc came back out to a restless crowd for a second, shorter set. To my ears delight, the timeless “Blue Light” was first up, and could not have been carried out any better. When you’ve listened to a band a certain amount of times, often tracks get shuffled under the rug, the bluest light however, has and will be a front runner for quite some time. Right before the aggressive “Flux” had the strobe lights pulsating endlessly, Okereke gently sung the familiar line ‘we found love in a hopeless place.’ I’d have to say, the words sound more succinct coming from his mouth. On to a song that garnered much debate and controversy, “Helicopter,” followed by a quick exit and reentrance, leading to a two-track encore. My initial thought was that “Trust” would be the final sound of the evening, but with it being the runner-up, it felt a little lacklustre. The finale however, felt quite like the opposite of eating glass. Like most of the fans who first heard Bloc Party via Silent Alarm, these 150 or so BPM’s were like a breath of fresh air to our music world. The verdict; Bloc can put on quite the Party, with a mixture of sounds and moods, old and new, they will have your eyes, ears and emotions fixated the entire evening. 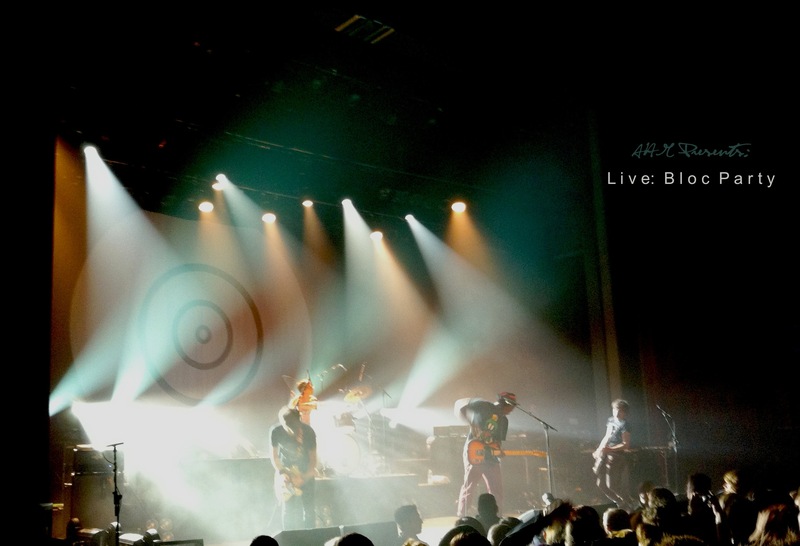 Drop a line below on yours thoughts of Bloc Party live.